"Someone, or something, has banished the day. For the past twenty hours, the full moon has hung unmoving overhead, heedless of the passage of time. In the distance...a wolf howls..."
For this event series we're bringing back the limited "Legend of Lycoan" EB! The Lycoan EB series will be available for the duration of the next 3 events. 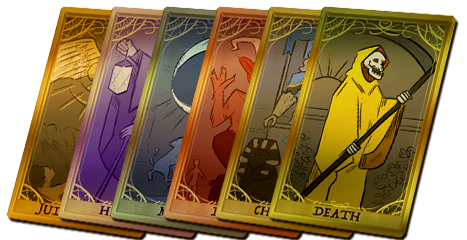 Players will also be able to acquire Tarot cards by completing certain Legends and Lycoan EBs (the higher the difficulty level the higher the drop chance). Those cards will be usable during the third part of this saga that will start on November 7th. The Lycoan EB is opened with Aevum Circle Pieces. 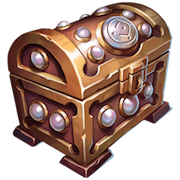 That EB also has the chance to drop a "Tri-Gem" box, which costs 3 keys to open, and drops a variety of premium items and has a rare chance of dropping some powerful charms. This event will be available from Wednesday, October 10th until Wednesday, October 24th at Noon PT. Furnishings exclusive to The Shackled Moon will be available in the Furnishings Shop, Lycoanite Box and Royal Lycoanite Box. Old tarot cards work here? 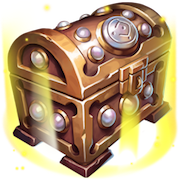 How often do we get legends quests to acquire these cards? Rouvicath wrote: Old tarot cards work here? Not yet! This EB requires Aevum Circles! To be more precisely 20 for the 1st one. The old tarot cards will work tho! But will be another EB and not this one. Last edited by -SS-Maikkie-SS- on Oct 10 2018, 11:48am, edited 1 time in total.